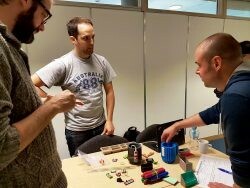 Horizon CDT student, Yitong Huang was recently successful in securing funding from the EPSRC funded Balance Network to deliver a design workshop to look at how smart objects can be co-designed to motivate healthier workplace behaviours. The half day event was held on 19 October at The University of Nottingham’s Jubilee Campus, with attendees from a variety of relevant stakeholders, including researchers, work health and wellbeing specialists and employees from Unilever UK Ltd., University College London, The University of Nottingham, Loughborough University and Resilience stress management. To start off the morning, Huang welcomed attendees and gave a presentation on her PhD research so far on designing and evaluating novel interventions delivered with smart objects to reduce prolonged sitting in office work, which she has been carrying out in the Horizon CDT and Mixed Reality Lab at Nottingham for the past two years, co-supervised by Prof Steve Benford and Asso.Prof Holly Blake. Huang also gave an informative Tech Demo of relevant smart objects and prototypes she planned to adapt for delivering her intervention. 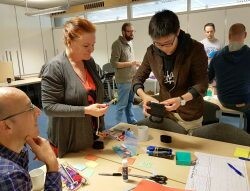 After the delegates had then evaluated the social acceptability of the idea and discussed potential deployment issues of using those objects in different office settings, two group activities took place, co-facilitated by Huang and Roma Patel, who is in her 3rd year of her PhD with the Horizon CDT and Mixed Reality Lab. 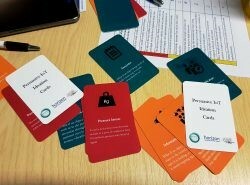 The first activity was developing design requirements with the support of Persuasive IoT Ideation Cards made by Huang and Patel for the purpose of this workshop; the second was a low fidelity prototyping and body storming session. Finally, the groups showcased and reported back on the design ideas and prototypes they had developed during the groupwork activities, and then had the opportunity to network further over lunch before the end of the workshop. Subsequent future collaborations and outputs from this workshop will be continued to be publicised and it is envisaged a future Digital Economy Network activity around this research area will be delivered in 2017, following on from the Enchanted Objects participatory design workshop delivered at the DE Summer School for Digitial Economy CDT students by Huang and Patel in July 2016 at Newcastle University.